If you are associated with site online business or online marketing domain, often, you must have been told to use search engine optimization to gain more organic traffic for more conversion on your website and to increase your sales, isn’t it? The primary reason behind this advice would be the fact that SEO is a significant part of successful marketing strategies, especially when it comes to increasing the sales on your website. However, those who aren’t really accustomed to this marketing tactic might think that SEO is nothing more than a waste of money or time. That’s exactly where your perception may go wrong, and you might end up losing a lot of chances of customer acquisition and conversion. To begin with, SEO is a process that helps enhance a website in several ways with an objective of ranking it higher on search engines and bringing it into the limelight whenever someone searches for a relevant keyword or phrase. Understanding how you generally find valuable information on Google will help you consider SEO an important technique for your website. This is also one of the main sources you start filling your sales funnel. The major and successful online business knows the importance of a larger audience for better sales and CRO on the website. Websites that rank higher and have huge sales usually depend on SEO for filling more people into sales funnel through search engines. They didn’t get there by any coincidence. Their owners and marketers use SEO to make Google comprehend what their website or content is all about. They would have also done extensive research to figure out how their target customers are looking for products and services that they’re selling. If you’re a professional or already familiar with the know-how of SEO, the entire procedure may seem like plain sailing. However, for beginners, things become even more difficult. Keeping this in mind, the need of acquiring advanced tools become even more obvious. ScrapeBox is one such tool that has been providing a helping hand to not just newcomers but several SEO experts as well. So, let’s review this amazing tool and how it can be helpful for your website. Undeniably, ScrapeBox has managed to grab a significant position among several other important SEO tools. It brings an array of advantageous features, proficient enough to enhance the position of your site on search engines. Apart from redirecting organic and relevant traffic to your site through different tricks, this tool also knows how to strengthen your link building techniques. With ScrapeBox, you can generate thousands of quality backlinks within an hour. On top of that, you can find a lot of more astounding ScrapeBox features in this tool that will remarkably improve the way you make your website SEO-friendly. The very first step in developing a website is to find a unique domain name. Considering the number of websites that go live each day, discovering such a domain that would make your website stand out from the rest is quite hard. In such a scenario, the Domain Availability feature of ScrapeBox will help you to a great extent. Using this one is pretty easy. All you’d have to do is type the focus keyword. And then, this feature finds out relevant phrases and keywords from Google Suggest, Amazon, Shopping.com, and more platforms. Once you have got the data, you can transfer it to Domain Availability checker and discover the available domains that would have relevant keywords in them. Whether you want to have a domain with a hyphen or without it, this feature makes everything possible. This considerable feature of ScrapeBox allows you to harvest a variety of URLs from a list of more than 30 search engines. Having the competence of scraping more than a million URLs in a minute, this feature is surely the fastest scraper existing on the internet. And then, this scraper can also be used on such websites that support a search feature. Be it a blog or a widely-used search engine; this feature is meant to be used with almost everything. Not just it lets you harvest simple links, but you can even use it for YouTube video links as well as domains that have high traffic. Search Engine Scraper has 30 pre-trained search engines, like Ask.com, Ramble, Excite, Mojeek, IXQuick, Blekko, Blingo, HotBot, DogPile, and much more. 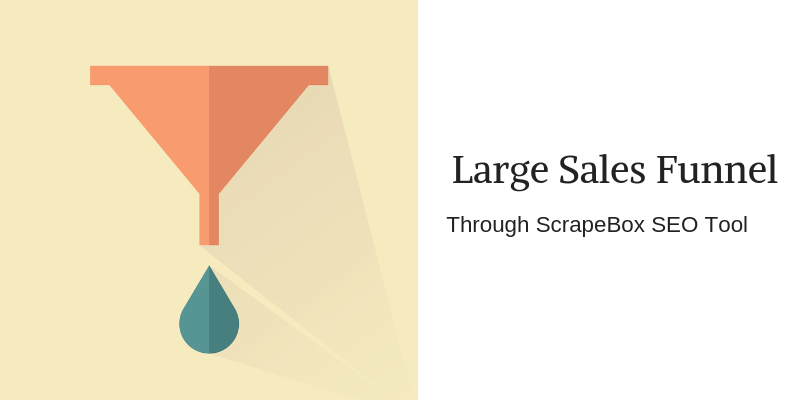 Another substantial feature of ScrapeBox is Email Scraper. 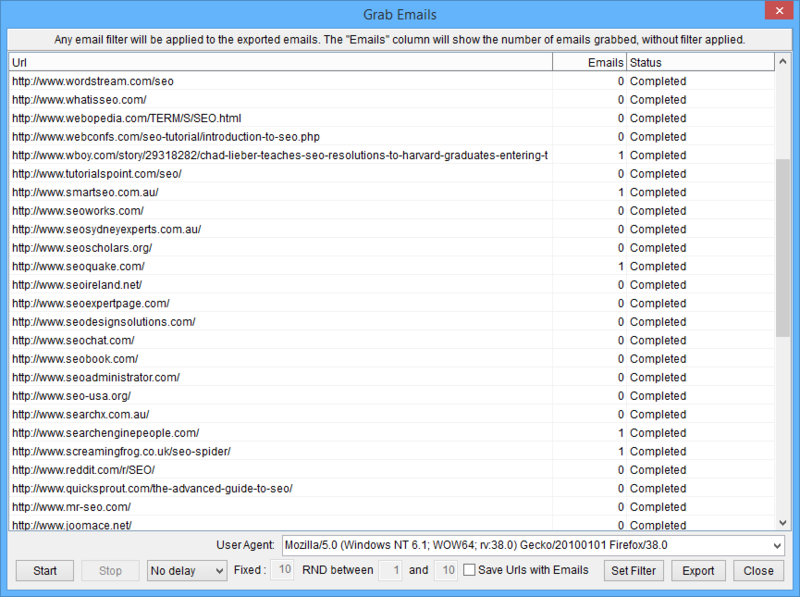 If you wish to scrape email IDs from different web pages, this one is the feature that you should use for this task. Without exposing your identity or getting your IP address blocked, this feature can harvest email IDs easily. One of the best aspects of this feature is that it can even work with https URLs or those websites that have been protected with secure connections. Moreover, you can also use it to fetch email IDs from social media platforms, such as Facebook, Twitter and more. While exporting email addresses, you can even save the source URL to keep the identification intact. Further, if you wish to extract only specific types of email addresses, you can filter them out and export. Amidst everything else, link building is one such technique that is powerful enough to bring organic traffic to your website and blog. 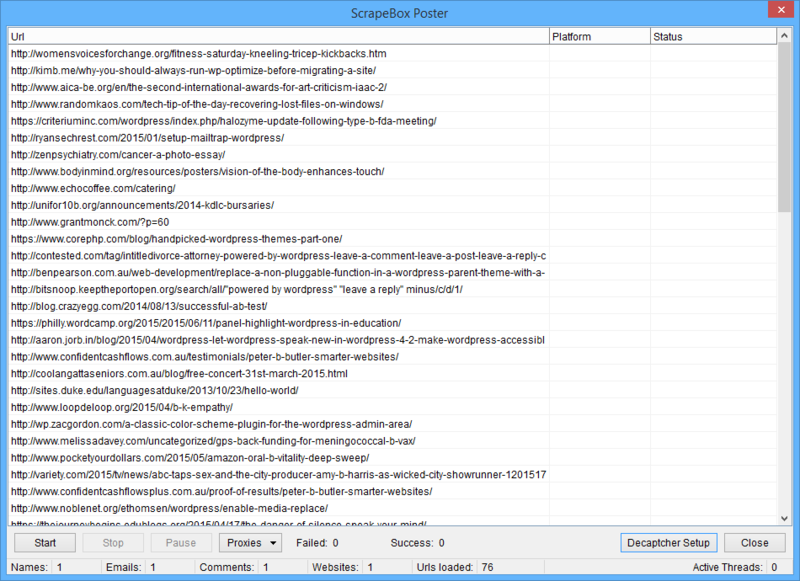 Hence, to make it easier, ScrapeBox provides you Fast Blog Poster feature. This one is a quick and multi-threaded feature that lets you post on a myriad of platforms, such as Blogs, Contact Forms, Trackbacks, Guestbooks, Forums, BBS Sites, Image Comments, and much more. To avert unethical SEO techniques, this feature uses image and text captchas to make sure that only whitelists keywords are being used. Though there are already a variety of platforms that this feature is pre-trained in, you can even add more to the list as and when necessary. 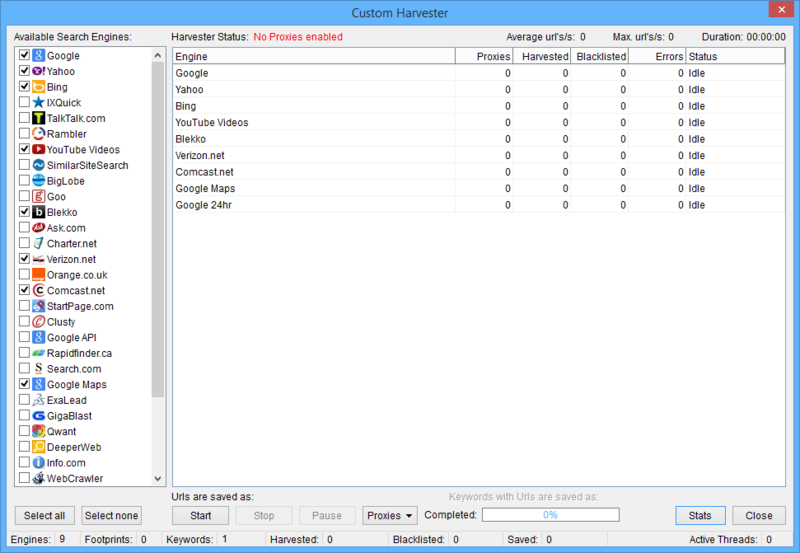 Out of all the advantageous features, ScrapeBox even comes with an inbuilt proxy harvester that lets you locate and test proxies. With this automatic feature, you would be able to perform a variety of tasks without any hassle. Right from creating backlinks to harvesting URLs from different search engines, there is a lot that this feature is capable of doing. Also, this one also comes with 22 inbuilt proxy sources, which will help to reduce the time and effort consumption for you. If you wish to have something more, you can also add customized sources to harvest proxies. As if that was not enough, this feature is also capable of removing duplicate proxies that are available on different websites at once. Being able to scrape millions of backlinks with this tool might seem fascinating. However, you cannot take the credibility of those links for granted. Thus, with URL Filtering feature, you would be able to filter qualitative and relevant links with ease. Once the harvesting is done, this feature gauges them on the basis of different authoritative measurements, like domain authority, page authority, Alexa rank, MozRank, Facebook likes, Twitter mentions, Pinterest Pins, URL page rank, and more. Thus, if you have set a specific standard of commenting and creating backlinks, this feature will help you with the same to a great extent. 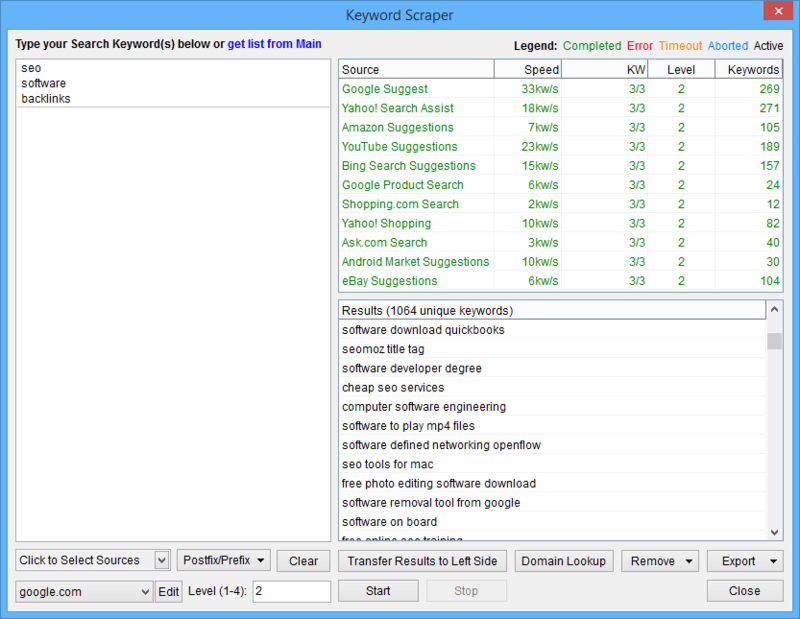 ScrapeBox’s keyword scraper is everything you would need if you belong to the marketers’ or a website owners’ community. It just takes a few seconds for this feature to dig out relevant keywords and scrape thousands of them. There are several places from where this feature extracts keywords, such as Yahoo Shopping, Yahoo Search Assist, Google Play, Google Suggest, Google Product Search, YouTube, Wikipedia, Amazon, Bing Search, Amazon, Alibaba Product Search, and more. This powerful feature will provide you with insight into the valuable data of what services, phrases, or products your target audience is searching. By offering similar things and fulfilling their requirements, it will be easier for you to convert more leads. And, you would be even able to optimize your content and website accordingly. There is a variety of platforms that this tool works with, such as UTF-8, Unicode, and ANSI character sets. Hence, it is proficient in supporting English, French, German, Chinese, Russian, Portuguese, and Japanese languages. Whether you are using a Windows system or an Apple one, this tool supports both of them seamlessly. Moreover, there is even an extensive list of operating systems supported by this tool, like Windows Vista, Windows XP, Windows 7, Windows 8, Windows 8.1, Windows 10, Windows 2003, Windows 2008, Windows 2012. It serves 32 and 64 bits. You can also use this tool with Windows imitated platforms, like VMWare, BootCamp Parallels, and more on Linux. Final Thoughts: Will ScrapeBox increase your sales? With this ScrapeBox tool, the entire process of search engine optimization can become hassle-free and simple for you. Be it installation or using, getting a hand over this tool would not be a difficult task for you. Once you have experimented with this software, using it will be quite easier. Therefore, if you are looking for a supportive tool that can take away your headache of SEO, you must try ScrapeBox once. There would not be any difficulties in renewal or payment as ScrapeBox supports one-time payment. Once you have purchased this tool, making your business the talk of the town would not be a big deal anymore. 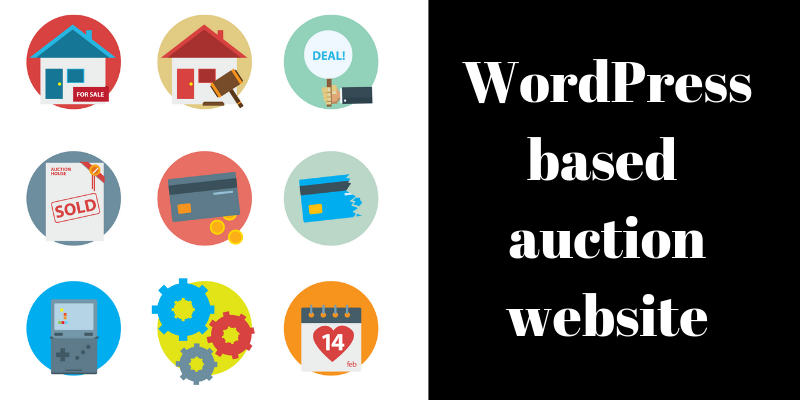 How to make a WordPress based auction website. "Sanjeev loves everything about WordPress. Always in constant search for new tools and Plugins keeps him hungry all the time. He spends his day brainstorming new ideas about new plugins and themes on WPeka and CyberChimps. You can follow him on his personal blog wordpress blog or Facebook .